Measurements: 5.2 cm W x 4.5 cm H x 1 cm ThickThickness at corner where thickest, tapering to 0.6 cm at thinnest at middle of side. 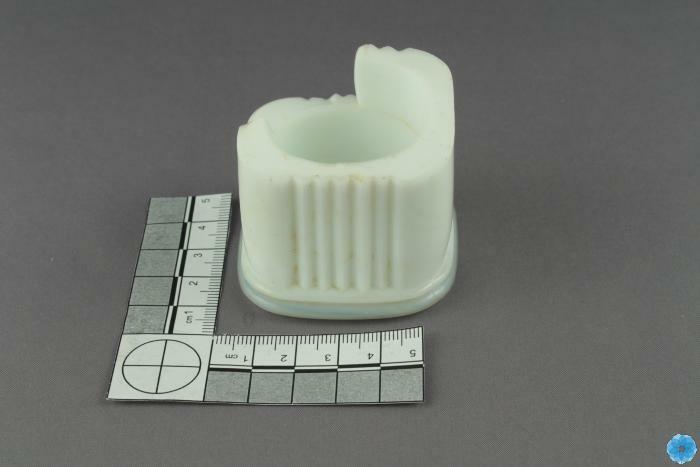 Description: Small, white broken jar base with top section broken off. Ridged on the sides, broader bottom. Likely a face or skin cream. Presented with random patches of dirt in side ridges and around bottom edge. History of Use: Size, design, colour implies a jar for skin cream.